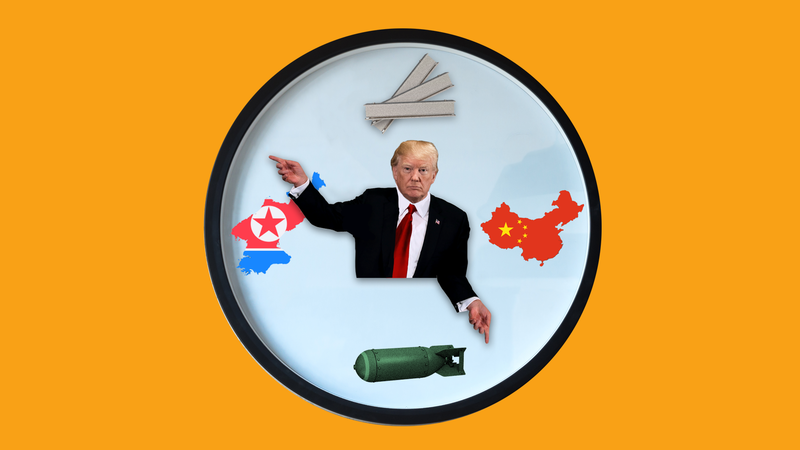 President Trump's desire to muscle the Chinese on trade is about to collide with his need for them to push Kim Jong-un on a nuclear weapons deal. The latest: Trump's trade delegation to China this week will reportedly be rebuffed on cutting the trade deficit and any cuts to the China 2025 industrial program, reports the NYT's Keith Bradsher. "Beijing feels its economy has become big enough and resilient enough to stand up to the United States." Axios China author Bill Bishop emails: "The question is will Trump huff and puff, and then fold into a face-saving hollow 'victory,' or is China different? I'm guessing the latter..."
The big picture: The Chinese could be a powerful ally in getting the North Koreans to take negotiations seriously. But if trade talks have fallen apart before Trump meets with Kim Jong-un, the U.S. could lose the ability to promise the Chinese better trade conditions in exchange for help on the North Koreans. Remember: The North Koreans have a history of promising concessions early, only to eventually demand so much that the South Koreans and Americans walk away. Why it matters: These incentives potentially play against Trump's maximalist negotiating style, as Axios' Jonathan Swan reported yesterday in his scoopy Sneak Peek newsletter. Israeli PM Benjamin Netanyahu says he has evidence Iran lied about its intention to develop nuclear weapons. Details. Merger Monday is back with a vengeance, with more than $72 billion worth of deals announced in the telecom, energy, retail and real estate sectors. Axios' Dan Primack breaks it down. Amazon will be expanding its Vancouver offices and adding 3,000 new jobs, which is expected to open by 2022. More. Juggernaut: House Minority Leader Nancy Pelosi raised $16.1 million in the first quarter of the year, including $15.4 million specifically for the DCCC. Details. Scoop: The American Petroleum Institute plans to soon name Mike Sommers, a former high-level Capitol Hill aide, as its next president and CEO, according to multiple industry sources. Details. Worthy of your time: Variety's Rebecca Rubin uses the "Infinity War" release to break down the absolute dominance of the Marvel franchise.